What gave you the idea to write THE SLOPE RULES? Being a Michigander, I’m no stranger to snow, but the winter of 2014 we had something like 120 inches. That happened to be the year of the winter Olympics, so I spent a lot of time snuggled on the couch thinking about snow and watching amazing athletes do incredible things with their bodies. I’ve always skied and thought it’d be fun to write about a skier—but not just any skier, a girl who isn’t afraid of anything and can hurl herself through the air like the best of them. Your main character is “one of the guys” and is quite a daredevil on the slopes. Do either of those describe you in high school? or what were you like? I was one of the guys most of my life—probably until my late 20s—and Cally is the most like me of any character I’ve written. As a child, you could find me outside—usually in a pile of dirt or playing some made up sport with the neighborhood boys. I’ll never forget being sent to the principal’s office for fighting in second grade (that was only one of two times I was ever sent there) and the principal calling out, “Come in, boys.” The other kid was really embarrassed to be there with me. I don’t consider myself a daredevil, at least not in the way Cally is. But I’ve always played sports, and when I was younger I didn’t shy away from going all out, even if it could end up in an injury. For example, I played basketball in high school and discovered that I was really good at taking charges. I’d sprint in front of whoever was driving the lane, plant myself in front of her, and let her run me over. I knew how to land so I’d slide across the floor and it almost always ended up in a foul against the other player. It’s obvious from reading the book that you know a lot about skiing. Is that because it’s a passion, or did you have to study up on it? I did do a lot of research for the terminology in THE SLOPE RULES, and I spent a day riding up the chairlift on the terrain park to watch how the kids interacted on the jumps and tricks. And I paid attention to my own skiing. When you’ve done something your whole life, you don’t think about the technique, you just do it, so I paid attention to little things like which leg you lean on to turn and what the snow sounds like when you catch an edge. What is your favorite skiing event? All of them? Except, ski jumping. I don’t know why I can’t get into it. Maybe because I don’t feel like it’s really skiing. Sure, you wear skis and you’re on snow, but it’s like comparing swimming and diving. They’re very different. As I skier, I appreciate the skill and discipline required for moguls, alpine, and slopestyle. They each require your body to react to one thing while already focusing on what’s coming next. Precision and speed are crucial, but they each demand something different and have the potential to hurt your body in a different way. Moguls are all about precision, alpine is speed, and slopestyle—well, slopestyle is like gymnastics on skis. I’d like to think that I could do a slow-motion version of the first two, but I’m in awe of the aerials. I tell people that Cally does things in skis that I can only dream of. Kissing scenes: Do they come easily for you or do you struggle? I love writing them! So much so that I have to remind myself to keep them PG-13, ha ha. They’re among my favorite scenes to read but I know they can’t be on EVERY page, so I try to pace myself. You switched genres for this book, from YA time travel to YA contemporary romance. What drew you to write a sweet contemporary romance, and was it very different for you? Also, as I’ve become more immersed in the world of YA, I’ve discovered that the books I enjoy the most are the sweet romances, the stories that are hopeful and romantic and have a happily-ever-after ending. I spent many years fighting my cheesy tendencies, but now I embrace them with open arms. I still have several darker novel ideas—even more so than my trilogy—but I plan to spend some time with Cally and her friends right now (hint, hint… companion novels). That’s awesome! Can’t wait to see where you take them next. Okay, now it’s time for our SPEED ROUND! Alpha males vs. sensitive types: Sensitive with alpha traits? Alphas who are sensitive? This one is hard for me. Rock vs. paper vs scissors: Scissors! 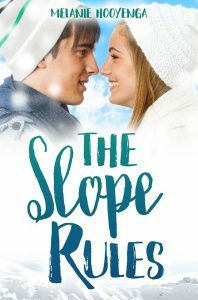 Melanie Hooyenga is the author of THE SLOPE RULES and the YA trilogy THE FLICKER EFFECT, about a teen who uses sunlight to travel back to yesterday. The first book, FLICKER, won first place for Middle Grade/Young Adult in the Writer’s Digest 2015 Self-Published eBook awards. 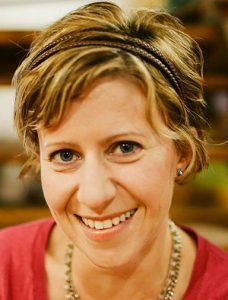 When not at her day job as Communications Director at a local nonprofit, you can find her wrangling her miniature schnauzer, Owen, and playing every sport imaginable with her husband, Jeremy. Thanks Brookie! I’m still in love with this book and absolutely adore the cover, so it makes me happy to hear you say that. I hope you enjoy! This book sounds adorable! I can’t wait to read it. Thanks for doing a guest post, Melanie! You’re welcome, Erin – and thank you! That sounds like fun research! I have to add this one to my TBR!